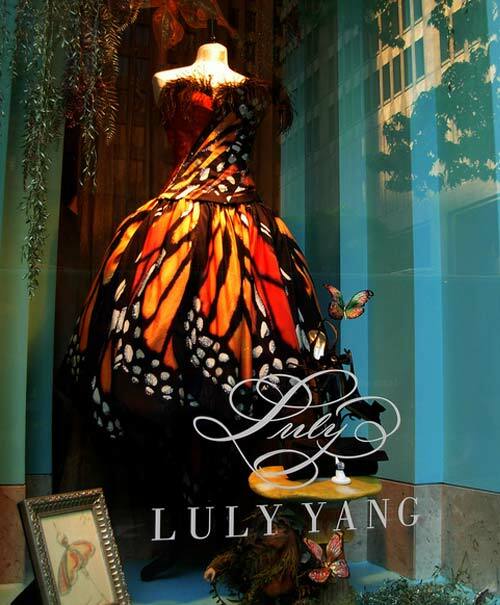 You may already have seen this amazingly-gorgeous-wow dress by Luly Yang. 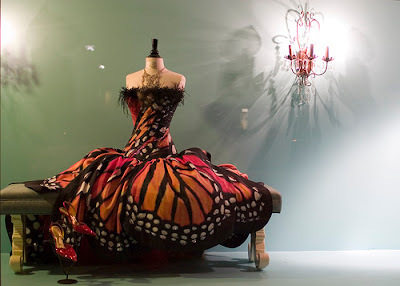 Although I'm not really into high fashion this incredible dress caught my eye quite a few years ago and I haven't forgotten it. Here's a slightly different version which is being used around the web. It appears to be designed after (ie. "in the style of") the Luly Yang dress but I don't know who the official designer is of this one or when it appeared. 2011 (as far as I can tell) was the first year a designer came close to making the same impact with an original take on the butterfly theme. 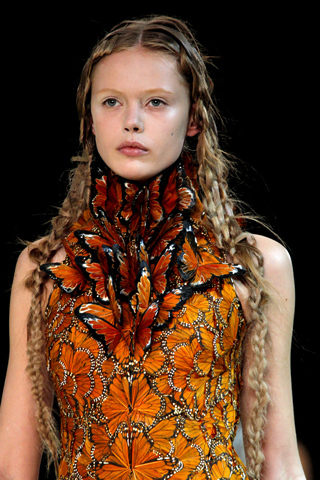 You have to admit, the monarch butterfly is so striking all on its own. 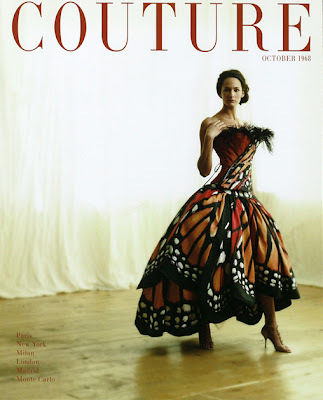 To have a dress that would make as big an splash not using the monarch design and colors would be difficult. One designer seems to have found a way to look beyond this (now) classic, still using the impact of the monarch but in a very different way. 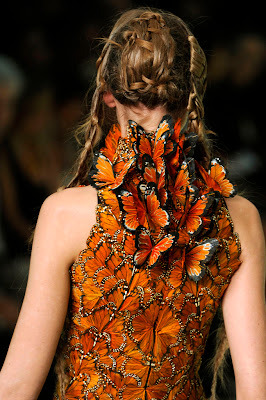 The designer is Alexander McQueen, who has an incredible flair for the fantastic in his designs. Check out the Alexander McQueen website and click on The Experience - wow. 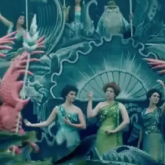 The 2011 collection in particular all looks like it was designed for a modern court of Faerie, complete with those princess-hip-flares [hip bustles??] you see in King Louis the XIV court styles. The 2011 collection is definitely nature inspired too so, again, perfect for a modern Faerie court. I only wish the dress were longer with a sleeker silhouette, rather than going for the hip-bustle (?) short skirt look. I think a long sheath version, perhaps with a large and long hem flare and train, would be incredibly elegant and regal. This is a backstage shot but I love the natural looking lighting here. I'll have to search to see if they did a magazine shoot for this dress. Imagine the possibilities! Normally you think butterfly dress = fairy queen or Midsummer Night's Dream and that certainly is fitting. I, however, can't help think of a butterfly dress being the perfect outfit for Cinderella. (Has anyone done that anywhere?) 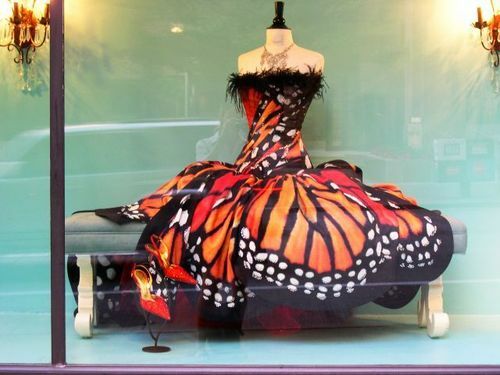 The metaphor is fitting and I even found a very different butterfly dress that would work for a Cinderella character too. 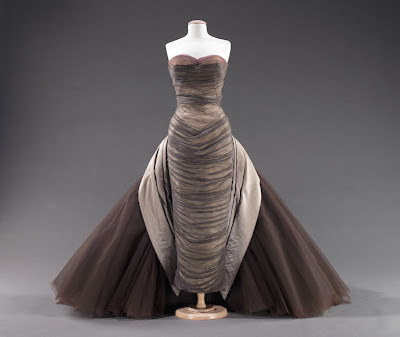 This dress is now in a museum and apparently marks an emergence in the history of fashion design (although this reminds me of ancient Egyptian silhouettes...). 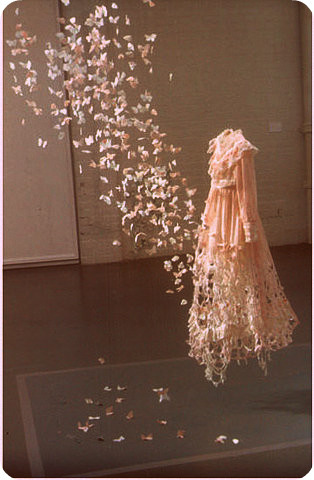 And since we're on the subject of butterfly dresses I had to include this art piece titled "While You Were Sleeping" by Su Blackwell (perhaps best known for her incredible fantasy paper cut work) which, again, feels very Cinderella-appropriate to me. Little aside: while butterflies have married well with Cinderella in my brain for some time now, I hadn't thought to connect Cinderella and sleep before. 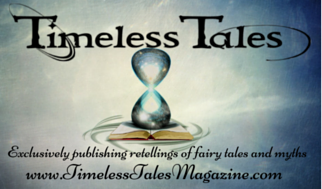 I love that there are so many different ways to look at the tales! 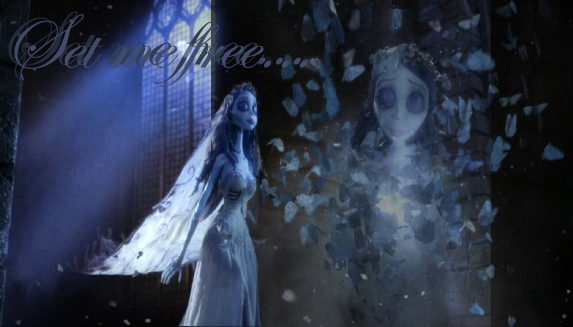 The dress, and other pieces of Ms. Blackwell's work, reminds me of that last beautiful scene from The Corpse Bride (which is, as you probably know, based on a Russian-Jewish folk tale). 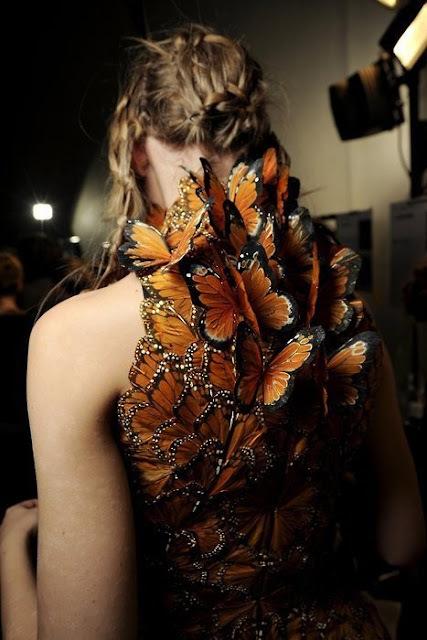 I wonder if Tim Burton was inspired by Ms. Blackwell and her butterflies? 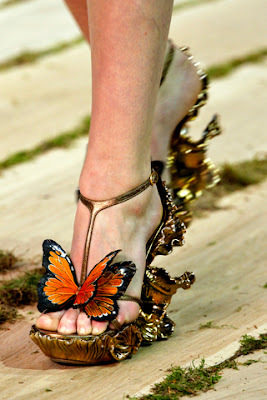 The butterfly is the running theme throughout that movie and is used so beautifully. You are right. 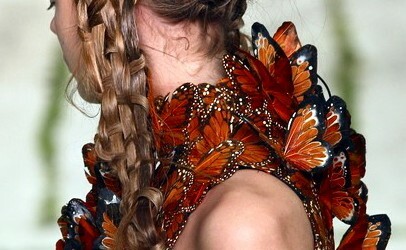 Copying the coloring of the Monarch Butterfly creates exceptional clothing. I loved your examples. The dresses are exquisite. Amazing! Every dress is so evocative and astounding. 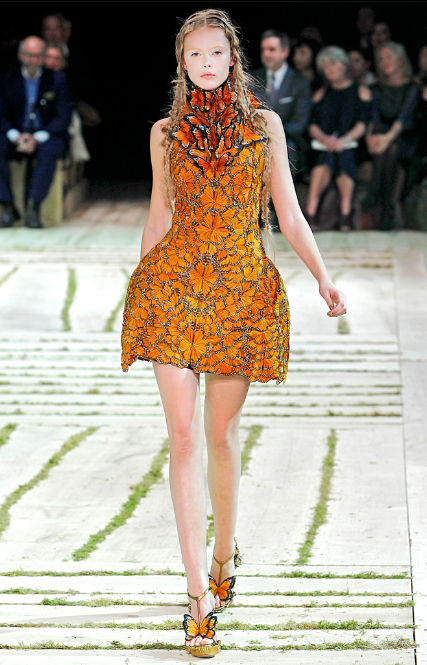 A. McQueen was my sister's (and my) favorite designer growing up. So sad that such an artist should fall before the renaissance of Faerie Tales. 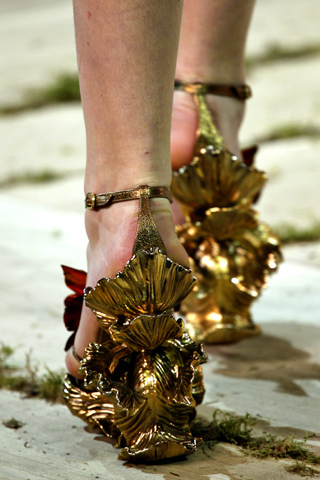 Also, I want those shoes!!! Those first two dresses are spectacular!